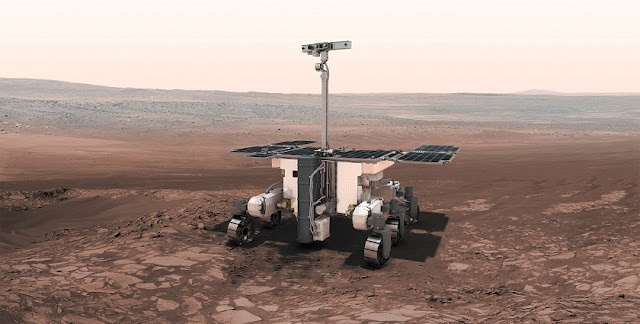 The European Space Agency (ESA) and the Russian Roscosmos State Corporation have decided on Monday, May 2 to postpone the second part of their joint ExoMars (Exobiology on Mars) mission from 2018 to 2020. The second stage of this endeavor will send a robotic rover to Mars to search for the existence of past or present life on the Red Planet. The decision to reschedule the mission was caused by delays of both Russian and European contractors. According to ESA, the teams made their best efforts to meet the 2018 launch schedule, even initiating an analysis of all possible solutions to recover schedule delays and accommodate schedule contingencies. A dedicated ESA-Roscosmos Tiger Team, also including Russian and European industries, presented recently its final report during a meeting of the Joint ExoMars Steering Board (JESB) held in Moscow, concluding that launch in 2020 would be the best solution. "The Tiger Team has presented their final report on the work that was done at the meeting of the joint Roscosmos-ESA executive steering board on the ExoMars project that took place in Moscow. Having assessed the conditions needed for the successful implementation of the project, JESB concluded that, taking into account delays caused by European and Russian contractors’ performance and bilateral deliveries of scientific equipment, it will be best to conduct the launch in 2020," Roscosmos said in a statement. After considering the Tiger Team report and the JESB recommendations, ESA Director General Johann-Dietrich Woerner and Roscosmos Director General Igor Komarov, decided to postpone the liftoff to the next available Mars launch window in July 2020. The space agency heads instructed their groups of developers to draw up a new baseline work schedule jointly with the industrial contractors. They also revealed that a series of additional measures will be taken to strictly oversee both sides' course of work over the period up to the launch in 2020. "What we have been doing lately is seeing if we could shorten the assembly, integration and testing (AIT) phase to something that would be acceptable from a risk point of view, but still make the 2018 launch. Very recently, we have concluded that this is not possible without adding a large amount of additional risk to an already risky mission. So, we decided the only responsible thing to do was move to the 2020 launch date," Rolf de Groot, Head of ESA's Robotic Exploration Coordination Office, told BBC. The 2020 ExoMars mission will also include an ESA carrier module and a Russian lander that will deploy the rover to Mars' surface. The stack will be lifted off atop a Russian Proton-M booster from the Baikonur Cosmodrome in Kazakhstan. The first part of ExoMars was successfully launched on Mar. 14, 2016 by Proton-M from Baikonur, carrying two passengers encapsulated in its payload fairing: the Trace Gas Orbiter (TGO), and the Entry, Descent and Landing Demonstrator Module (EDM) called “Schiaparelli”. TGO will monitor seasonal changes in the atmosphere’s composition and temperature in order to create and refine detailed atmospheric models. It will also serve as a telecommunication relay satellite for the mission in 2020. Schiaparelli is expected to demonstrate the capability of ESA to perform a controlled landing on Mars. The lander is expected to separate from the TGO on Oct. 16, 2016 and three days later, when the orbiter will be inserted into Martian orbit, Schiaparelli will try to land on the Red Planet. ESA and Roscosmos believe that the successful implementation of all stages of the ExoMars project will allow them to jointly test advanced technologies for entering the atmosphere, handling a descent and landing on Mars and operating space equipment on the Martian surface. The mission is also expected to help the agencies develop new technical solutions and design service systems that may be used in other projects to study other planets in the solar system.